At its core, Economics is the study of how humans make decisions in the face of scarcity. These can be individual decisions, family decisions, business decisions or societal decisions. If you look around carefully, you will see that scarcity is a fact of life. 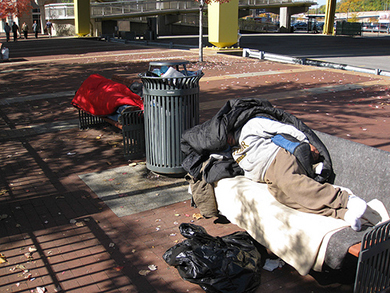 Scarcity means that human wants for goods, services and resources exceed what is available. Resources, such as labor, tools, land, and raw materials are necessary to produce the goods and services we want but they exist in limited supply. Of course, the ultimate scarce resource is time – everyone, rich or poor, has just 24 hours in the day to try to acquire the goods they want. At any point in time, there is only a finite amount of resources available. Think about it this way: In 2016, the labor force in Canada contained 19.4 million workers, according to Statistics Canada. The total area of the Canada is 9.99 million square kilometres. These are large numbers for such crucial resources, however, they are limited. Because these resources are limited, so are the numbers of goods and services we produce with them. Combine this with the fact that human wants seem to be virtually infinite, and you can see why scarcity is a problem. If you still do not believe that scarcity is a problem, consider the following: Does everyone need food to eat? Does everyone need a decent place to live? Does everyone have access to healthcare? In every country in the world, there are people who are hungry, homeless, and in need of healthcare, just to focus on a few critical goods and services. Why is this the case? It is because of scarcity. Let’s delve into the concept of scarcity a little deeper, because it is crucial to understanding economics. Think about all the things you consume: food, shelter, clothing, transportation, healthcare, and entertainment. How do you acquire those items? You do not produce them yourself. You buy them. How do you afford the things you buy? You work for a wage. Or if you do not, someone else does on your behalf. Yet most of us never have enough to buy all the things we want. This is because of scarcity. So how do we solve the problem of scarcity? Every society, at every level, must make choices about how to use its resources. Families must decide whether to spend their money on a new car or a vacation. Towns must choose whether to put more of the budget into police and fire protection or into the school system. Nations must decide whether to devote more funds to national defence or to protecting the environment. In most cases, there just isn’t enough money in the budget to do everything. So why do we not each just produce all of the things we consume? The simple answer is most of us do not know how, but that is not the main reason. Think back to pioneer days, when individuals knew how to do many more practical tasks than we do today, from building their homes, to growing crops, to hunting for food, or repairing their equipment. Most of us do not know how to do all—or any—of those things. It is not because we could not learn. Rather, we do not have to. 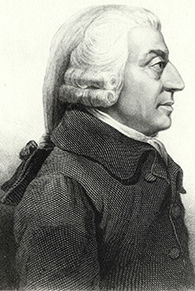 The reason why is something called the division and specialization of labor, a production innovation first put forth by Adam Smith in his book, The Wealth of Nations (See Figure 2). To illustrate the division of labor, Smith counted how many tasks went into making a pin: drawing out a piece of wire, cutting it to the right length, straightening it, putting a head on one end and a point on the other, and packaging pins for sale, to name just a few. Smith counted 18 distinct tasks that were often done by different people—all for a pin! Modern businesses divide tasks as well. Even a relatively simple business like a restaurant divides up the task of serving meals into a range of jobs like top chef, sous chefs, kitchen help, servers to wait on the tables, a greeter at the door, janitors to clean up, and a business manager to handle paychecks and bills—not to mention the economic connections a restaurant has with suppliers of food, furniture, kitchen equipment, and the building where it is located. 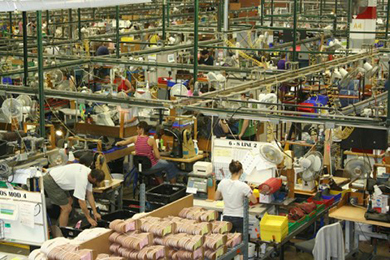 A complex business like a large manufacturing factory, such as the shoe factory shown in Figure 3 can have hundreds of job classifications. First, specialization in a particular small job allows workers to focus on the parts of the production process where they have an advantage. (In later topics, we will develop this idea by discussing comparative advantage.) People have different skills, talents, and interests, so they will be better at some jobs than at others. The particular advantages may be based on educational choices, which are in turn shaped by interests and talents. Only those with medical degrees qualify to become doctors, for instance. For some goods, specialization will be affected by geography—it is easier to be a wheat farmer in Saskatchewan than in British Columbia, but easier to run a tourist hotel in BC than in Saskatchewan. If you live in or near a big city, it is easier to attract enough customers to operate a successful dry cleaning business or movie theater than if you live in a sparsely populated rural area. Whatever the reason, if people specialize in the production of what they do best, they will be more productive than if they produce a combination of things, some of which they are good at and some of which they are not. However, specialization only makes sense if workers can use the pay they receive for doing their jobs to purchase the other goods and services that they need. In short, specialization requires trade. You do not have to know anything about electronics or sound systems to play music—you just buy a phone, download the music and listen. You do not have to know anything about artificial fibers or the construction of sewing machines to wear a jacket—you just buy the jacket and wear it. You do not need to know anything about internal combustion engines to operate a car—you just get in and drive. Instead of trying to acquire all the knowledge and skills involved in producing all of the goods and services that you wish to consume, the market allows you to learn a specialized set of skills and then use the pay you receive to buy the goods and services you need or want. This is how our modern society has evolved into a strong economy. It is hard to overstate the importance of economics to good citizenship. You need to be able to vote intelligently on budgets, regulations, and laws in general. Economics seeks to understand and address the problem of scarcity, which is when human wants for goods and services exceed the available supply. A modern economy displays a division of labor, in which people earn income by specializing in what they produce and then use that income to purchase the products they need or want. The division of labor allows individuals and firms to specialize and to produce more for several reasons: a) It allows the agents to focus on areas of advantage due to natural factors and skill levels; b) It encourages the agents to learn and invent; c) It allows agents to take advantage of economies of scale. Division and specialization of labor only work when individuals can purchase what they do not produce in markets. Learning about economics helps you understand the major problems facing the world today, prepares you to be a good citizen, and helps you become a well-rounded thinker. 1.1 What Is Economics, and Why Is It Important? by University of Victoria is licensed under a Creative Commons Attribution 4.0 International License, except where otherwise noted.